Concrete, along with cement based repair mortars and grouts, have significantly extended set times in cold weather. For every 10° F drop in ambient temperature, initial set for cementitious repair mortars can increase by 10% to 20%. Initial set for concrete can take up to 30% longer for the same 10° F decrease in temperature. A 10° F drop in ambient temperature can increase set times by 10 – 20 %. As a result, contractors use accelerating admixtures like Freezban during cold weather to achieve initial set sooner. This has the dual benefit of allowing them to finish the concrete more quickly, and providing the concrete with early age strength gain as a protection from damage caused by freezing. Although we think of concrete and repair mortars as very strong in compressive strength, they are comparatively weak in tensile strength (approximately 10% of compressive strength). Freshly placed concrete has yet to develop full strength and is very susceptible to damage caused by the expansion of water as it freezes. Accelerating early age strength gain is essential for cold weather concreting or repair. Freezban Liquid – Liquid calcium chloride set accelerating admixture for masonry mortars and non-reinforced concrete. Increases early and ultimate strengths. Freezban Beads – Dry bead calcium chloride set accelerating admixture for masonry mortars and non-reinforced concrete. Increases early and ultimate strengths. 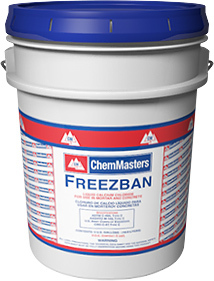 Freezban NC – Non-chloride formula, set accelerating admixture for masonry mortars and concrete containing or adjacent to steel reinforcement or other metal building materials. Increases early and ultimate strengths. Remember to fully read and understand the Product Data Sheet prior to using any construction chemical, and to always dilute Freezban products in the mixing water before adding to the mortar. Never add Freezban directly to the already mixed mortar. Cold weather is just around the corner. Don’t get caught on a job wishing you had a set accelerating admixture. Order your Freezban today. FreezBan™ Liquid and FreezBan Beads are multipurpose admixtures for use with portland cement/lime mortar & prepared masonry mortars & non-reinforced concrete. This exclusive formulation combines an effective & time proven chemical accelerator, calcium chloride, with a powerful wetting agent. FreezBan™ NC is a set accelerating/water reducing liquid admixture for concrete and mortar and is formulated without calcium chloride or chloride ions.